Yep we’ve made it to half a century! Later this week issue 50 of Lights Go Out will be released! 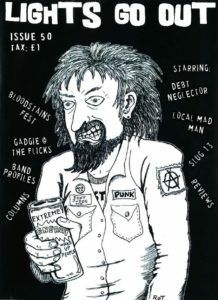 This issue features: Debt Collector, Local Mad Man and Slug 13 interviews. A feature on Bloodstains Fest. Gadgie @ The Flicks sees Marv tackle Alien 3. Then there’s the usual columns and reviews (music and zine). Band profiles of The Garage Flowers, MUX and Rivita too. The front cover is by the talented Craig Henning.